Triomax comes in new T3 and T6 series, designed to suit light and heavy loads. The options are your choice to suit differing requirements. Triomax T3 in 35kg light loads is now more affordable yet offering superior sliding action and excellent soft-closing mechanism. 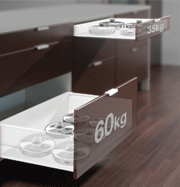 Now for heavy loads the Triomax T6 has been designed for loads up to 60kg making the T6 the correct choice for the ever popular wide and deep drawers. This versatile system provides high stability with consistent smooth opening and closing action even under heavy load. Wood is the primary material used to create natural living environment. The demand for high quality wood furniture is ever increasing. Triowood is a concealed system that ensures the full natural beauty of the wood furniture is retained with assurance of a perfect close every time. Triowood's design is based on proven Trio technologies. Sliding action is consistent even when fully loaded. 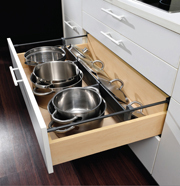 The integrated soft-close mechanism automatically adapts to the closing speed and drawer load.